This silver U ceiling loop plate is a minimalist way to achieve the ‘drape and drop’ lighting effect. Ideal if you want to put a ceiling pendant light in a place where you don’t have a ceiling rose for the wiring – just use some of these ceiling plates to drape a length of fabric cable from where your ceiling rose is, to where you want your light to ‘drop’. You’ll need to use cable ties to secure the fabric cabling or your light will drop for real. Not cool. 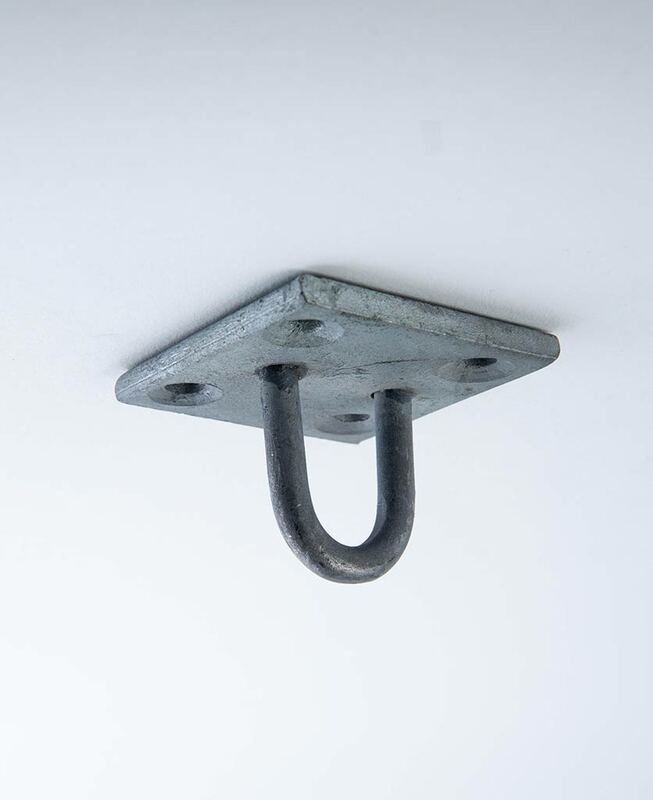 Our inherently robust ceiling loop plate silver has a u-shaped design. It is perfect for using to create gorgeous statement ceiling lights in your home. Made from galvanized steel, this plate looks beautiful in an industrially styled room. Think exposed brick, polished concrete floors and reclaimed wooden furniture – a real New York loft style vibe. This ceiling loop plate is an ideal accompaniment for our create your own lighting range. A collection made up of fabric cable, ceiling roses, light bulbs, bulb holders and cage light shades in a variety of colours and finishes. To create a drape and drop style light feature we recommend using a multi-point ceiling rose. Coordinate with retro black twisted fabric cable and raw steel accessories for a perfectly polished look. Finish off with a series of filament light bulbs draped around your room for maximum impact. A sophisticated approach to industrial style.